A quick note before I get back to the regular programming: I just wanted to thank everybody who supported my last two posts (about blog burnout and last week) through emails, texts, and comments. The last few days have been difficult, and going back to the routine of blogging and social media has been a little bit hard to swallow — I can't help but feel that this space is so silly and inconsequential when compared to what's been happening elsewhere! But as I said in my last post, with such uncertain times ahead of us, it's important that we don't lose sight of the things that bring us joy and happiness. So thanks for putting up with my Twitter despair, and I hope that this blog continues to serve as a fun little refuge for both you and me. The other day, it occurred to me that I had been in New York for nearly six months and still hardly knew my new neighborhood at all, let alone the rest of the city. Several visitors had come to town asking me for recommendation and I froze, realizing that I only knew the bakeries and restaurants that all major publications and literally everybody else had already recommended. To be fair, it was an incredibly busy last few months. There was all the traveling in September (to Copenhagen! to Hershey! to eastern Washington! to Feast! ), and all the friends and families traveling through town (not to mention that it literally took us two months to move into our Brooklyn apartment). So with all the hustle and bustle, it really feels like I haven't established a routine yet, or set aside a time to really get to know the new neighborhood and the city. So that all needs to change. It turns out that I am a creature of habit. I need the routine in my calendar, times when everything is the same all the time so I can actually make room and find the time for the new things like exploring the city. Does that make sense? Hopefully you get the gist. 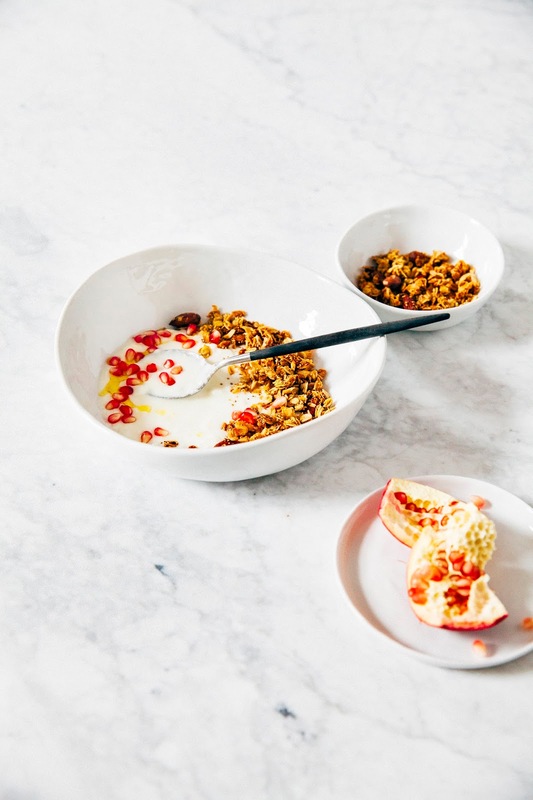 This granola comes from Alanna Taylor-Tobin's cookbook, Alternative Baker. Alanna is the incredibly talented blogger and photographer over at The Bojon Gourmet and her new cookbook is absolutely beautiful and full of wholesome, wonderful recipes. 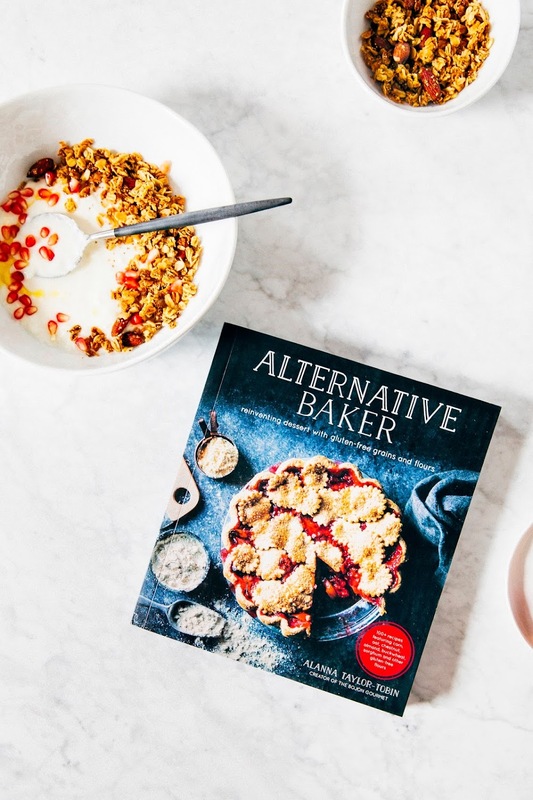 Alternative Baker focuses on baking recipes that use alternatives (hence the name) to all-purpose flour, instead using grains like almond, buckwheat, millet, and oat flours. 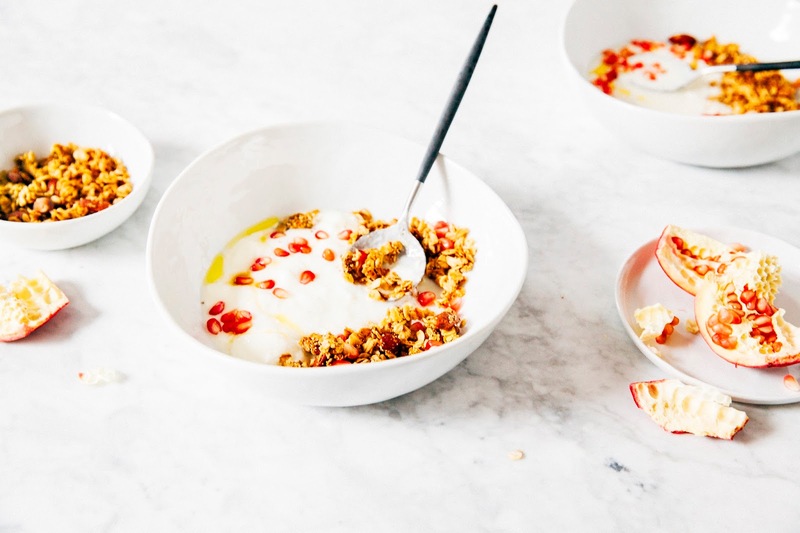 This granola uses amaranth, a grain used by the ancient Aztecs in religious rituals. Cooked amaranth has got a ton of nutritional value, and is an excellent source of protein and fiber. 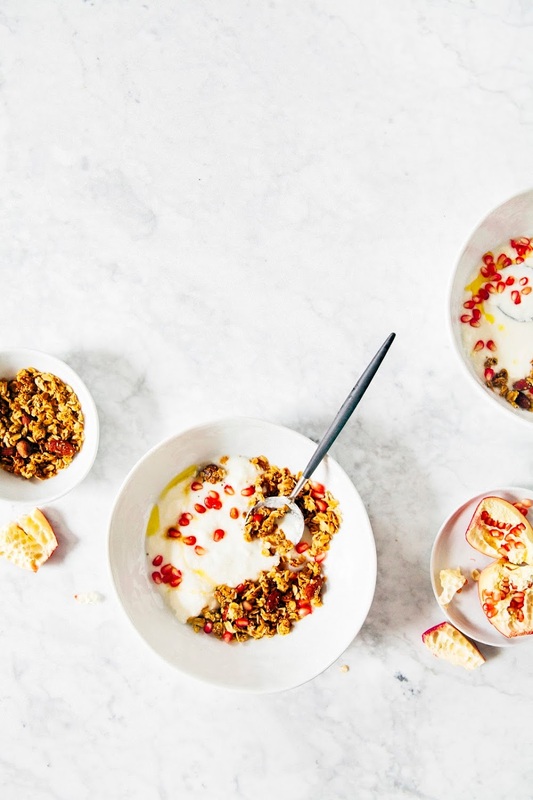 In this granola, they add a toasty flavor that makes the entire thing taste like a crisp, crunchy oatmeal cookie. 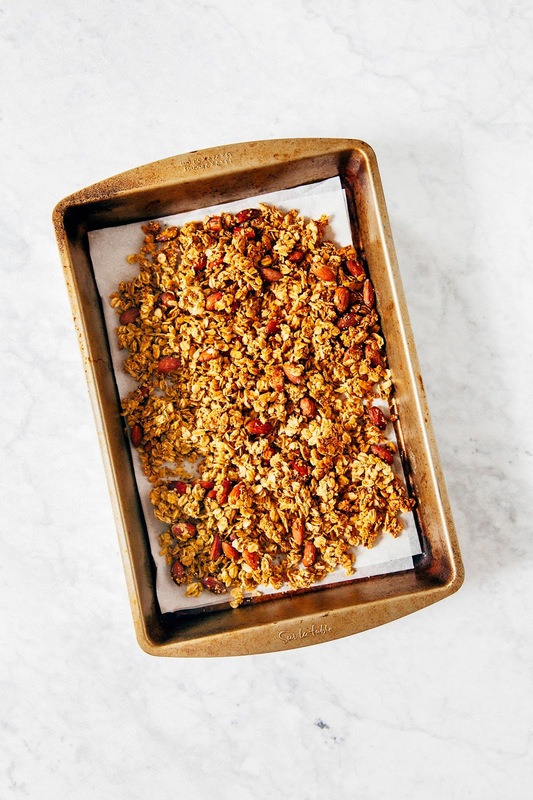 Alanna uses a genius trick: she bakes the granola in between two sheet pans, ensuring that it bakes in a cluster that clumps into a thin, granola bar. 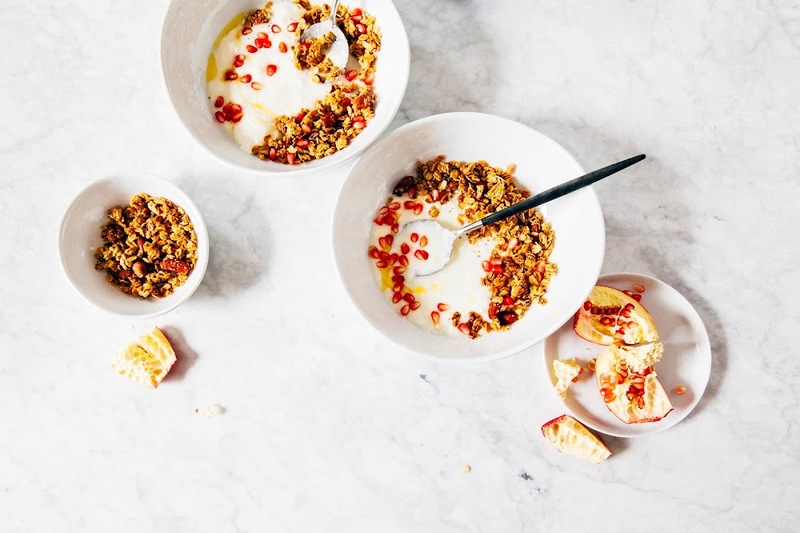 Unlike traditional granola recipes that require you to toss the granola every so often, her trick basically eliminates all that extra work! Center a rack in the oven and preheat to 325 (F). Prepare a baking sheet by lining with parchment paper and set aside. Heat a medium, heavy-bottomed skillet over medium heat until very hot. Add 2 teaspoons of the amaranth seeds and shuffle the pan so that they are in a single layer; the seeds will begin popping immediately. Shake the pan frequently, every few seconds, keeping the amaranth in a single layer until about half the seeds have popped (they will turn white in color when they do) and the rest are golden. Tip these into a large bowl, and repeat until all the amaranth has been popped or toasted. To the bowl of popped amaranth, add 2 1/2 cups old-fashioned rolled oats, 1 cup whole raw almonds, 1/4 cup dark brown sugar, 1/4 cup plus 2 tablespoons maple syrup, 1/4 cup plus 2 tablespoons olive oil, 3/4 teaspoon kosher salt, 1 teaspoon pure vanilla extract, and fresh zest from 1 large orange. Stir very well to combine, making sure to evenly distribute the salt and amaranth seeds. Scrape the mixture onto the lined baking sheet, and use a rubber spatula to spread it to a thin layer across the pan. Ideally, the edges will be slightly thicker than the center, as they weill bake faster. Lay a second piece of parchment over the granola, and place the second sheet pan on top, right side up, making a little granola sandwich. Transfer to the preheated oven and bake for 20 minutes. Rotate and continue baking for another 10 to 20 minutes for a total of 30 to 40 minutes or until the granola is a rich golden brown, peeking under the parchment to make sure that the edges aren't burning. When you pull it out of the oven, it will still be soft, but will crisp as it cools. 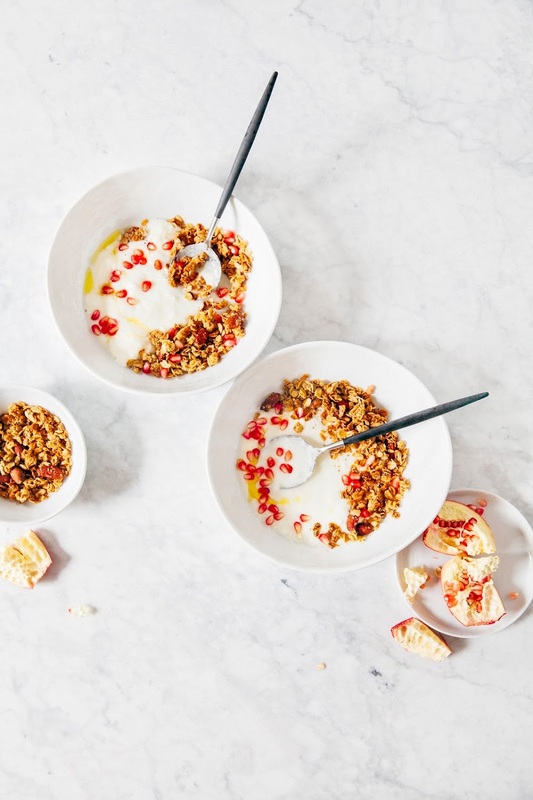 Let the granola cool completely in the sheet pan sandwich on a wire rack, about 1 to 2 hours, before breaking up into large sheets or clumps and storing in an airtight container for up to 1 month.